McGauley and others have been roused by [Trump’s] the president’s call to restore order and defend the country against what Trump has called “an invasion,” as thousands of Central American migrants advance slowly through southern Mexico toward the U.S. border. Trump has insisted [without any evidence] that “unknown Middle Easterners,” “very tough fighters,” and large numbers of violent criminals are traveling among the women, children and families heading north on foot. McGauley said. “My phone’s been ringing nonstop for the last seven days. You got other militias, and husbands and wives, people coming from Oregon, Indiana. We’ve even got two from Canada.” Asked whether his group planned to deploy with weapons, McGauley laughed. “This is Texas, man,” he said. [T]he military is concerned about the arrival of “unregulated militia members self-deploying to the border in alleged support” of U.S. Customs and Border Protection. 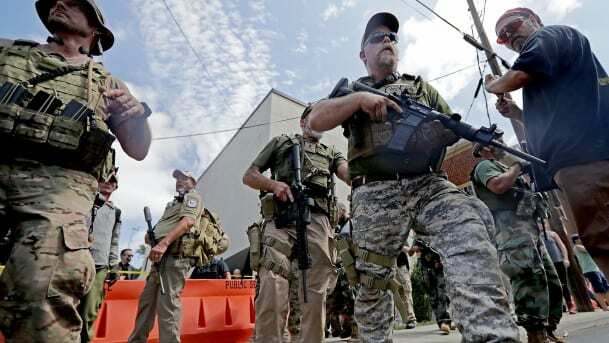 “They operate under the guise of citizen patrols,” the report said, while warning of “incidents of unregulated militias stealing National Guard equipment during deployments.” The military report provided no further details about the alleged thefts.